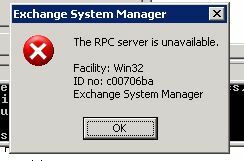 When you try and change either the Domain Controller, or the Exchange Server to another Server, on the Exchange Recipient Update Services (RUS), you see the following error. Drop to command line and try and ping the FQDN of the server you are trying to change to. A different IP address will probably respond, this will be due to an incorrect WINS/DNS entry, if you cannot find the incorrect entry, then place an entry for the FQDN of the new server in the Exchange servers host file.